The Medeco® Springlatch deadbolt features a 9/16" throw heavy-duty deadlocking latch that prevents shimming or "loiding" the bolt with a credit card or similar tool. 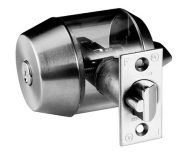 The deadlatch automatically deadlocks when the bolt enters the strike and is recommended for use on pool gates, security gates, and other applications where automatic locking is required. - Unitized assembly for 2-1/8” cross bore fits most existing cutouts. - 9/16” throw stainless steel latch bolt for resistance to "loiding" or slipping the latch. - 2-3/8” or 2-3/4” backset for flexibility in installation. - Exterior assembly with rotating security collar for resistance against wrenching. - Single unit interior assembly with two 1/4" - 20 mounting bolts for mounting strength. - Available with Medeco3 high security cylinders or KeyMark® SFIC cores. - Meets or exceeds ANSI A156.5 Grade 1 specifications and holds up to heavy use.